A few weeks before draft day, we reiterated just how good we felt Jennings could be. Despite averaging less than 20 minutes per-game, shooting under 40% from the field, and playing a constantly shifting role during his time in Italy, Jennings natural talent was too much for the Milwaukee Bucks to pass up with the 10th overall selection. Blessed with outstanding athleticism and natural talent, Jennings has easily been the most pleasant surprise of this seasons rookie class a much needed stroke of luck for a Bucks franchise that accommodated his growth into a budding NBA star by opting not to match the Minnesota Timberwolves offer sheet to then-incumbent starting point guard Ramon Sessions. With the luxury tax looming just above Milwaukees payroll figure, three of their top four scorers from the previous season signed to suit up elsewhere, and Michael Redd facing an uphill battle to round into form after tearing his ACL last January, the Bucks were nothing short of a best-case scenario for the then 19-year old Jennings. With countless possessions at his disposal to make mistakes and a Head Coach tailor-made to help him improve on his weaknesses in Scott Skiles, Jennings has been a godsend for the 15-21 Bucks. While no one will dispute his talent at this point, if Jennings had landed elsewhere, there is a distinct possibility that he wouldnt be enjoying as much success as he currently is. The Bucks sub-.500 record certainly isnt blowing anyone away, and they have really struggled as Jennings has fallen into a slump, but the fact that they are being led by a rookie point guard that almost no one saw as an immediate starter is noteworthy. In spite of the negative publicity Jennings drew after failing to qualify to attend Arizona out of Oak Hill Academy, the persistent questions about his meager production in Italy, his current shooting slump, and the growing pains hes had to work through as both a person and player, Jennings NBA career is off to an outstanding start. Perimeter shooting is the area that Jennings needs to work the most on if hes to come anywhere close to reaching his full potential as a scorerhes made just 22 of 99 attempts from beyond the arc in 43 games in both the Euroleague and Italian league this season, or 22%. Jennings has a tendency to contort his body and fade away excessively on many of his attemptssomething hes been working on extensively with assistant Nenad Trajkovic, who was hired after Nando Gentile replaced former head coach Jasmin Repesa in December. Trajkovic worked for many years as an assistant and head coach with Serbian powerhouse Partizan Belgrade, widely considered the best team in European basketball in everything revolving around developing young players. Last May when Jennings was finishing off of his tenure in Rome, we were fortunate enough to get an incredibly in-depth view of his situation during our European scouting tour, a luxury that shockingly few (if any) NBA teams opted to take advantage of, certainly not to the same extent. At that juncture we found Jennings enlisting the services of Lottomatica assistant coach Nenad Trajkovic to craft himself into the jump shooter he is today: one capable of putting up 55-points in an NBA game and being a threat to exceed 20-points on any given night. The healthy appetite Jennings showed for shooting after practice has provided the most notable shift in his skill set from the last time we wrote about him on two fronts. First, the consistency of his footwork and accuracy from beyond the arc have improved dramatically since last season. One of the biggest knocks on Jennings during both his high school days and throughout his foreign excursion was his outside jump shot. Displaying erratic form and a penchant for taking off balance shots especially off the dribble Jennings work with Trajkovic seemed to get the ball rolling towards a sounder, more refined shooting mechanic that features excellent rhythm and significantly improved balance. The dramatic effect that the tweaks Jennings has made to his form are clear in the outrageous differences in his situational shooting percentages from last season. Through 36 games this season, Jennings has scored 1.44 PPS (Points Per-Shot) in catch and shoot situations according to Synergy Sports Technology, good enough to land him in the 99th percentile League-wide and an astounding improvement from the 1.08 PPS he posted in such situations in 43 games last season with Roma. Even with the slump Jennings has been in over the past few weeks, those numbers are nothing short of amazing considering that he shot 22% from beyond the European arc (substantially closer than the NBAs) last season . Second, the level of confidence Jennings displays in his perimeter repertoire has risen noticeably from last season. Willing to step up and take responsibility as his teams primary option in the clutch, Jennings has developed the short memory and aggressive shooters mentality that will serve him well as he grows into a star Jennings hasnt let his recent struggles get into his head as hes continued to be aggressive. As with many young guards thrust into a big role, the Compton native has had his fair share of issues with shot selection, something that isnt really a surprise all things considered. An overwhelming 72% of his catch and shoot opportunities come in situations where he has a hand in his face, according to SST. However, in a testament to the way this season has gone thus far, Jennings has made 54% of such attempts, more than 10% better than when left open. While the work Jennings did during his preparations for his rookie campaign have had eye-opening improvements in some aspects of his game, they havent been as beneficial to others; his catch and shoot numbers only tell a fraction of the story. Though Jennings has clearly taken strides as a spot up shooter, he has a lot of work to do on other aspects of his perimeter game, particularly his pull-up jump shot. After shooting a torrid 49.3% from three in November, Jennings has seen his shooting percentages diminish significantly to the point that he shot just 32% from distance in December, and 29% thus far in January. Despite the fact that his percentages are dropping, he continues to attempt even more 3-pointers each game, which will likely bring his numbers even further down to earth. A large portion of that dip stems from his decision-making after he puts the ball on the floor, when he appears all too eager to force 20+ footers over defenders. Some of his willingness to force shots stems from poor shot selection as evidenced by the threes hes takes regularly off the dribble, but the fact that he takes it upon himself to be his teams first option and is easily the Bucks best shot creator doesnt help either. Free to take the first available look he creates, Jennings is never shy when he sees an opening, but the bad habits he appears to have worked out of his spot-up jumper still limit the efficiency of his mid-range game. Prone to fading away, relying heavily on his pull up under duress, and not always holding his release as religiously as he does when shooting off a catch much like he did when we saw him in Rome; Jennings converts just 34% on his shots off the dribble. Compare that to his relative efficiency from a stand-still and it becomes apparent what has caused Jennings shooting to fall off the map, and where he needs to improve in the future. If he can take the steps necessary to improve his shot selection, continue to work on his mechanics, and translate his poise to his midrange game, history says hell do just fine. His first month in the NBA was surely too good to be true, but for a player who was often-maligned for his shooting; it was certainly a very encouraging sign of progress. The best things that Jennings brings to the table, though, definitely cant be taught. Hes incredibly fast in the open floor, highly fluid getting up and down the floor, and extremely natural changing directions sharply and attacking the rim. In todays NBA, where speed is absolutely at a premium like at no other point in time, Jennings has game changing potential as a shot-creator. One of Jennings biggest weaknesses, as we identified last summer, lies in his lack of physical strength. Extremely quick and agile with the ball, he has proven time and time again that he can get to where he wants to go on the floor with relative ease. Able to explode out of his crossover in a manner reminiscent of Allen Iverson, Jennings is a nightmare for the majority of the League to stay in front of. Under the NBAs current hand-check rules, Jennings is able to use his full repertoire of hesitations, stutter steps, and in-and-out moves to create driving angles that few guards have the quickness to cut off. While no one is going to question Jennings mobility in half-court sets, one of the biggest knocks against the young guard is his inability to convert the shots he creates for himself at the rim. According to our friends over at hoopdata.com, Jennings only converts a paltry 42% on his shots at the rim, one of the lowest rates of any point guard in the NBA a problematic ranking for a player capable of getting to the rim at will. This is a topic that was discussed in an in-depth article by Kevin Pelton today on Basketball Prospectus. Many of the issues Jennings had around the rim in Europe persist in the NBA. Though hes able to find seams to the rim, he frequently appears uncomfortable once he gets there. Despite his excellent leaping ability, Jennings struggles excessively with contact, failing to shield the ball and finish strong, and regularly finds himself smothered by rotating post defenders. His skinny frame hurts his effectiveness in the paint, since he struggles to even get the ball up on the rim after he takes a bump. Perhaps the more pressing issue is that he hasnt yet learned the nuances of drawing fouls effectively. Over time, Jennings needs to hone that craft to maximize the offensive potential of his outstanding athleticism, as there is simply no reason why he should be converting just 39% of his 2-point attempts, one of the worst rates of any player in the NBA. While Jennings certainly has a lot of things to work on, one scout we talked to was impressed by his efforts to develop his floater. One of the hardest shots in basketball, Jennings shows a deft floater from time to time, which certainly bodes well for him in the future, but still has a hard time converting in traffic. With opposing teams able to game plan around Jennings with Michael Redd ailing and now out for the whole season, hes going to face a lot of adversity from the mid-range in, a real challenge that should prove invaluable to his long-term development. Anyone who had the pleasure of watching Jennings early in his high school career got a taste of his instincts as a playmaker, and his play last season Italy spoke of his potential to translate his passing ability to the NBA level. A gifted passer who shows the ability to thread the needle in traffic and put the ball right on the money running full speed in transition, the biggest positive changes in Jennings game from the beginning of this season to now both qualitatively and quantitatively- reside in his merits as a point guard. Statistically, Jennings has clearly come a long way from last season, and even from last month. During his season playing in the Euroleague, he posted an assist to turnover ratio of only 1.37, a representation of the difficulties he had translating his natural instincts into his role as a change of pace scorer. Fast-forward to his first month as a pro, Jennings showed marginal improvement in November, posting an A/TO ratio of 1.75 an adequate mark for a rookie floor general. During the month of December, Jennings posted a mark of 2.91, likely thanks in no small part to the return of Michael Redd. Clearly deferring to Milwaukees recovering franchise player, Scott Skiles impact on Jennings is apparent at times. During November many of Jennings assists were the result of his knack for the things that arent easy to teach. Extremely good at putting the right amount of touch on his lob passes and hitting his teammates in stride, Jennings has excellent court vision allowing him to be highly effective working off the pick and roll in half-court sets, scenarios that account for roughly half of his offensive possessions. Jennings made a conscious effort to involved Redd in Milwaukees offense to a fault, sometimes hesitating when hes created his own shot and unselfishly sacrificing his offense to create for others. With Redd now out for the season, it will be interesting to see how the rest of Jennings season plays out. Though Redds presence had refocused Jennings passing, the biggest change in the young floor general as a point guard from last season to this season in a qualitative sense lie in his comfort level operating in traffic. Many of his turnovers early this season were the result of losing the ball either after being trapped or when trailed by a defender in transition. Skiles influence is clear in the way Jennings now controls the ball. No longer prone to letting defenders sneak up on him, Jennings does a better job of using his body to shield the ball when pushing it up the floor. Hes also appeared more decisive on his drives. From day one, Jennings has looked extremely aggressive running the pick and roll, but he seems more poised and disciplined with the way hes been attacking the lane. Many of his drives that resulted in turnovers earlier this season were the result of allowing the defense to string his drives out to the wings, allowing additional defenders to get involved. Recently, the former McDonalds All-American has been more composed when he turns the corner. Instead of forcing drives across the court in an effort to turn the corner after using screens, he has been better about using his first step to get to the elbow and then kicking when he sees defenders respond. Though he still makes his fair share of rookie mistakes, this newfound discipline has helped Jennings maintain the spacing in the Bucks offense and has increased his assist numbers while decreasing his turnovers. Considering how natural a passer Jennings is in terms of pure court vision, he would be well served to continue developing this part of his game rather than attempting to become an Allen Iverson-type scorer, as that would clearly give his team a much better chance of winning games. Hes already shown an extremely quick trigger early on in his career, ranking 16th amongst all NBA players in field goal attempts per-40 minutes pace adjusted, despite the fact that he converts just 39% of his attempts. In the same way that it limits his finishing ability at the rim, Jennings lack of physical strength hurts him defensively, as we repeatedly noted. At this point, Jennings is a mixed bag on the defensive end. There are certain scenarios where he excels because of his physical tools, but others where he is inherently limited. Perhaps the best thing that can be said about Jennings defense at this point is that his effort level is considerably better than it was in Italy, which is a major step for a player as young as he is. In terms of weaknesses, there are three key areas where Jennings seems to struggle. First, as we saw last season, he has an extremely hard time working around screens. Appearing even leaner than his listed 169 pound weight because of his rangy frame, even a player as quick as Jennings cant always recover from a well-set ball screen. Second, he is a clear liability against stronger, more compact guards in the post. Whether his man posts up in a traditional sense or is able to get a step on him in an isolation situation, once Jennings is in a compromised position on his mans shoulder, he doesnt have the strength to regain any ground to contest the shot. Third, and finally, Jennings still struggles with some of the fundamentals, especially in the way he defends the perimeter off the ball. Periodically getting turned around when making rotations and often leaving his feet when closing out shooters, Jennings is definitely still learning what it takes to be a sound defensive player on the NBA level. While there are certainly a number of deficits in Jennings defensive abilities, hes exceedingly good in other areas. His quickness allows him to pressure the ball extremely well from end to end, allowing him to pester opposing point guards with a one-man press. He also shows a willingness to pursue loose balls, whether it be rebounding or looking for a steal. More than anything else, the fact that Jennings gets in a stance and doesnt give up on plays as frequently as he used to is a huge step towards his development into a respectable NBA defender. Considering all the criticism Jennings received (surely from our direction as well) for his decision to go overseas and his Green Room debacle on draft day, hes certainly taken everything in stride. The hard-line style of former Lottomatica coach Jasmine Repesa seemed to ignite a maturation process in Jennings that continues today. Showing a willingness to learn, playing with a passion that has earned him the respect of his teammates, and working tirelessly in practice, the humbling experience Jennings had in Europe has been integral in the success hes found in the NBA. DraftExpress: So Brandon, how nervous are you right now? Brandon Jennings: Im not nervous at all, just a little worried you could say with all of the trades that have been going on. Washington doesnt have a pick now so I think its going to shake up the draft a little bit. DX: Any idea where youre going to get picked? What are you hearing? BJ: Im actually not hearing anything, so I dont know if thats a good thing or a bad thing right now. I cant really control the draft, so whatever happens is whats meant to be. So Im just going in with a positive attitude and whatever happens, happens. DX: You worked out for a wide range of teams, starting with the top ten picks and now most recently with Phoenix (14) then New Jersey (11). Has anyone given you the indication that youre strongly in the mix? DX: Some guys decline to come to the green room perhaps because they were a little afraid of being the last one in the green room. Has that thought crossed your mind at all? BJ: Yeah it actually has a lot. Being on the road with some of these guys, they make you think a little bit, should I go, should I not go? Some of these guys were saying, no way, you arent going to see me sitting alone in the green room. So I had a little bit of cold feet thinking about it, actually Im still thinking about it, so I dont know yet. Reporter: Has anyone asked you to be there? Did the League make a request for you to come? BJ: No, but its a once in a lifetime opportunity. You get to shake David Sterns hand, thats what everyone dreams about. Reporter: You talk about how you dont really have much control over what happens in the draft, but when you see these trades go down, do you guys start twittering or texting each other about it? BJ: My Twitter has been blowing up lately, but I havent really been getting a chance to look at it, Ill get back to those guys after the draft. You know a lot of the guys are shocked about the trades that have been happening. So now, basically, its about who Minnesota picks; I think whoever they take in those two spots are going to change the whole draft around. Reporter: What would make your strategy of going to Europe pay off in your mind? Is it anywhere in the first round? The lottery? Do you have a point where you say I made the right decision? BJ: I think if I go top five. If Im a top five pick then Ill think for sure it was the right decision, and I think even top ten, but top five would really stand out. DX: And if you dont go top ten was Europe a bust? BJ: No because I did get that year of playing professional basketball under my belt, so you cant take that away. DX: You got a lot of money too. BJ: The money was cool, but I think just being around grown men and playing that different style of the game and learning different things was good too. Im sure Ill get a lot of heat from the media, Im sure a lot of people will think, well you see what happened to Jennings so you probably dont want to do the overseas thing. So Im sure there will be a lot of negativity, but Ill be ready for it. Reporter: Do you think the college basketball community is rooting for you to do well or not so well? BJ: [Laughs] Probably not, because if I go top five I think youll see a lot more guys going overseas. Its a great experience, I think more kids should do it just to step out of their comfort zone and see how strong they really are as a person. I think I showed that this year and I think I showed everyone that I can handle my own when I was out there, even though I didnt play a lot. Reporter: Was any part of it hard for you? The basketball part? The personal part? BJ: I think the off the court stuff was difficult sometimes. We didnt have any dryers so we had to hang dry our clothes for two days, the food was different, some people spoke English but a lot didnt. On the court the style is different; its not a very open court game involving a lot of isolation, its strictly team basketball. Reporter: If you get picked by a team like the Knicks, a big market team, do you think youre even better prepared to handle it now? BJ: Yes; you know New York is a great marketing city, but I doubt I get picked by the Knicks. I think everyone knows who theyre trying to get, so Im not really going to talk too much about them. I mean I would love to be there in NYC, dont get me wrong, you see what DAntoni did for Steve Nash in those two years. But I think any team that I go to Ill be ready mentally. Reporter: How much more would Roma have to pay you for you to stay there this year? BJ: It wasnt about the money at all. I just wanted to go over there and do my year and learn. It was like a pre-draft for me. I just went over there and learned things and I wanted to bring it back to the NBA. At the end of the day the dream of every kid is to play in the NBA. Reporter: What did you learn by being in Italy for the year? BJ: Well actually it just made me realize how good we have it over here. When you step out of your comfort zone and you go to other places and see how they live, you sit back and you realize that youre blessed to be an American and live in the States. We dont know how good we have it until you get out of your comfort zone. 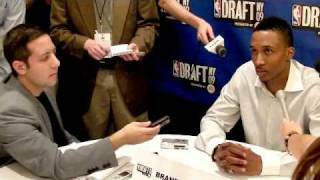 Reporter: How nervous or excited are you for the draft tomorrow? BJ: I havent really been thinking about it too much. Ive been a pro already. So I have some money in my pockets already. Im just chill about the situation but this is a little different. This is the NBA so I just cant wait till its over. Reporter: How has your game improved by playing in Europe? BJ: Im more mature. Out of high school I was a little wild. I just did whatever I wanted to do. But I think Europe has slowed my game down. I read situations more off the pick and roll and overall, Im just a better point guard. Reporter: Do you think playing in Europe for one year is more important than playing in college for one year? DD: Yeah I think so, because the pick and roll game is a big thing in the NBA. Thats all they run in the NBA and its the hardest thing to stop. And overseas Ive been doing that for a whole year now. In college you really dont do too much of that. A lot of people play zone, a lot of people press, so the game is totally different. So overseas, I was also able to learn the up and down game because its more of a half court game. Who would you consider the most under-rated player in this years draft based on their talent and where they are projected to be picked?? Attractive young mothers in their early 30s push babies in designer strollers in the perfect 85 degree weather of early May. They leisurely walk past a group of students sitting atop ridiculously high pink stools outside a Sushi bar wearing cutoff t-shirts with catchy slogans like go vegetarian! Welcome to Flamini, the Park Slope of Rome, a trendy neighborhood just north of the bustling city center. Ciao, ciao, ciao, ciao, ciao, ciao, ciao they chirp at each other seemingly all day long. A few blocks away, at the Palazzetto dello Sport, amongst the ruins of the 1960 Summer Olympic site, a 19-year old American by the name of Brandon Jennings is absolutely dominating an inter-squad scrimmage consisting of multiple members of the Italian national team and some of the most coveted import players in the Italian league. Pitted against one of the best defenders in Europe in American guard Ibi Jaaber, Jennings gets to wherever he wants on the court, showing blazing speed, outstanding ball-handling skills, incredible creativity and a real flair for making flashy plays. He makes spot-up and pull-up jumpers from inside and outside the arc, runs the pick and roll to perfection while flicking gorgeous underhanded bounce-passes right on the money to a flashing Andre Hutson, and even tries to go up and challenge former NBA center Primoz Brezec in transition with an emphatic dunk. Even though their regular season ended on Sunday, no one on the team knows when they will be playing their first game in the quarterfinals of the Italian playoffs. The league is evaluating a spiteful appeal made by legendary Italian team Fortitudo Bologna (formerly home to NBA players such as Dominique Wilkins, Marko Jaric, Carlos Delfino, and Marco Belinelli amongst others) against a narrow loss they suffered to Teramo this past weekend, which shockingly relegated them to the second division. The frivolous protest will surely be denied, but in the meantime, the entire league sits and waits for a new playoff schedule to come out. Just another day in the wacky world of Italian basketball. Jennings situation isnt much clearer. With the team having signed journeyman Slovenian power forward Jurica Golemac to add depth to their extremely banged up frontcourt, the future lottery pick may now be the odd man out when the team submits their 12-man roster on game-day, as Lottomatica Roma is now over the quota for foreigners. Welcome to the world of an American teenager in European basketball. When given the opportunity, Jennings has shown he can be productive at this level. We had the chance to sit alongside two NBA head coaches and one Director of Player Personnel as Jennings played the second most minutes hes seen all season long this past Sunday, as Rome knocked a bad Cantu team out of the playoffs in a game that was meaningless for his squad since they had already locked up the second seed in the playoffs in the previous round. 8 points, 7 assists, 3 turnovers, 3 rebounds and 2 steals was his final line. Having made a long trip out to Rome, we were all just happy to see him step on the court after notching a DNP-CD the previous week. Little did we know, Jennings would end up having one of his best games of the season. One year ago we got the chance to see Jennings practice, scrimmage and play in the week leading up to the Jordan Brand Classic in New York. A few months prior to that, we saw him lead his Oak Hill squad to victory in the Hoophall Classic in Springfield. Comparing the Brandon Jennings we saw then with what were seeing now might make you rub your eyes in disbelief. Gone is the brash, arrogant teenager with the Kid N Play style flat-top who dominated the ball in absolute fashion and looked first and foremost for his own shot, his stats and the ultimate high-light play. In his place is a much more mature, respectful young man, always cheering on his teammates, showing great body language and painstakingly trying to do what his coaches ask of him, almost to a fault at times. A similar theme ensues for the rest of the night, as Jennings refuses to force the issue time after time, not hunting shots in the least bit, looking extremely focused on facilitating the offense, making the extra pass to the point that you may have wondered if hes being a bit too passive even. Another transition opportunity occurs after yet another steal, and Jennings connects with Ibrahim Jaaber on a perfect give and go pass for an easy layup, as the ball doesnt even touch the ground once. Thats not to say that everything is all rosy at this point with Jennings gamehe still has a significant amount of work to do on his decision making skills and shot-selection before he can be considered an efficient point guard. While its obviously not fair to compare his stats as a rookie in the Euroleague and Italian league with that of his NCAA counterparts, the fact that hes shooting just 38% from the field on the season cant be viewed as a positive. Perimeter shooting is the area that Jennings needs to work the most on if hes to come anywhere close to reaching his full potential as a scorerhes made just 22 of 99 attempts from beyond the arc in 43 games in both the Euroleague and Italian league this season, or 22%. Jennings has a tendency to contort his body and fade away excessively on many of his attemptssomething hes been working on extensively with Bosnian assistant Nenad Trajkovic, who was hired after Nando Gentile replaced former head coach Jasmin Repesa in December. Trajkovic worked for many years as an assistant and head coach with Serbian powerhouse Partizan Belgrade, widely considered the best team in European basketball in everything revolving around developing young players. After every practice, Jennings works with Trajkovic on his shooting, getting up as many as 500 jumpers. He credits Trajkovic with helping him improve his mechanics significantly (going straight up and straight down, extending my arm, not fading away too much anymore, keeping on balance, not turning my hips a lot Jennings explains), and indeed his shot looked much better than advertised in the three practices we observed, although he still has plenty of room to continue to improve, particularly with his pull-up jumper. The best things that Jennings brings to the table, though, definitely cant be taught. Hes incredibly fast in the open floor, highly fluid getting up and down the floor, and extremely natural changing directions sharply and attacking the rim. In todays NBA, where speed is absolutely at a premium like at no other point in time, Jennings has game changing potential as a shot-creator. Look no further than the way a relatively unheralded player like Aaron Brooks has been able to put his stamp on this years NBA playoffs for evidence of how valuable a speed demon like Jennings can be in the right offense. All the bumping and hand-checking hes been learning to deal with all season long from European defenders might make life a lot easier for him once he reaches the NBA, where everything is much more open thanks to the defensive 3-second rules and much tighter officiating on the perimeter. What separates him from the Aaron Brooks and Monta Ellis of the world, though are his playmaking instincts. His talent and creativity with the ball were always evident in the games, scrimmages and practices we saw, as he sees the floor and is capable of making incredibly difficult passes look easy, in a way that no point guard in this draft not named Ricky Rubio can. Over the course of our three days in Rome, we saw Jennings make a handful of mind-blowing plays that hint of an incredible future that is in store, particularly in transition or running the pick and roll. Harnessing that talent will be an ongoing process for Jennings, as he is not what you would call a polished player at this point. Turnovers remain a major issue for him--he commits one on 23% of his possessions in the Italian league according to our advanced stats, as he still lacks a great deal of experience operating in the half-court and is prone to making questionable decisions at times. He clearly lacks the strength to finish many of the plays around the rim hes able to create for himself at this level, so continuing to add strength to his lanky frame will also be a priority moving forward. Something that must be pointed out is the fact that Jennings doesnt even really run the point for Rome that much, as hes often slated next to either of Romes dominant ball-handling guards Ibrahim Jaaber or Sani Becirovic. Clearly there wasnt a great deal of thought put into how these players complement each other on the part of the club or Jennings' camp when the roster was assembled last summer. There is no doubt that in another situation, Jennings may have been able to better put his playmaking talent on display, as he was obviously on a very short leash here in Rome. Defensively, Jennings has made great strides since he first got to Romeits not rare to see him come up with some excellent possessions on this end of the floor each and every gamebut he still has a ways to go here as well. His long arms, excellent quickness and outstanding hands make him a terror in the passing lanes for examplehe ranks second in the Italian league in steals per-40 pace adjusted, but he also has a tendency to reach excessively and try to pick players pockets from behind. Hes learning how to use his body and speed better to stop the ball, but older, more experienced point guards are able to take advantage of his over-exuberance and lack of strength at times, lulling him to sleep and then blowing right by him. Off the ball, he has a tendency to lose his focus on occasion, and hes still a major target for the bruising, moving screens European big men are known to set, which he has a difficult time fighting through. In the game we saw he picked up three cheap fouls in less than 90 secondstwo of them clearly being rookie callswhich forced him to play very cautiously from that point on. There is one clear-cut benefit from playing in Europe, though: Ive got the flopping down pat! Jennings jokes. AAU basketball and high-level European basketball are worlds apart. Brandon Jennings got to experience the difference first hand and it shows in his numbers. Jennings has the second lowest usage on this list at 7.6 Pos/G, and his .77 PPP is the worst. The rigors of international basketball arent kind to the average eighteen year old, and considering he threw himself to the wolves in signing with a team playing on the highest levels in Lottomatica Roma, he struggled as expected. His athleticism let him make some plays from time to time, but his inexperience was constantly apparent in his shot selection. He took 2.1 pull up jumpers per game, but only hit 21% of them. He shot under 25% from the field when running the pick and roll and when isolated as well. The fact that he was fouled on merely 6.2% of his halfcourt shots didnt help his PPP in those areas either. Jennings was at his best in spot up situations, but his 1.07 PPP is still only a bit above average though he did put up 1.39 PPP on open catch and shoot jumpers. News isnt all bad for Jennings, as he turned the ball over less than average (15.2% of halfcourt Pos), but at the end of the day, he scored on merely 29.7% of his possessions. Jennings struggles may make any point guard considering the jump from high school to the top level of Europe think twice, as its likely just too big a jump in competition to overcome in a minimal role in a single season. For the Blue team, the center of attention as always revolved around the flamboyant presence of their point guard Brandon Jennings. He dominated the ball for every minute that he was on the floor, pounding it excessively during certain stretches and making phenomenal plays in others, showcasing his outstanding athleticism and talent level, but also making some of the people in attendance grumble about his somewhat selfish style of play. Quick shots early in possessions, a little mano a mano with the pesky Kemba Walker (who went right at him), and some incredible flurries of imagination all typified the high-usage, high-octane play of Jennings. He was awesome splitting the defense and finding cutters with his lightning quick bounce passes, incredibly flashy with his ball-handling skills, and also played absolutely zero defense on the other end of the floor. The problem with Jennings is that he seems more concerned with looking good than playing winning basketball. This is not something that we came up with from watching him in the all-star game setting, but also very much evident when we went out to watch him play with Oak Hill back in December. He only seems interested in passing the ball if he will definitely get an assist, which causes a lot of standing around from his teammates and probably doesnt make him the most fun guy to play with. Its way too early to make any definitive conclusions about how he will turn out, but Lute Olsen and Arizona will most certainly have work to do regarding the way he runs a team, because its just not a style that is conducive to winning games, despite the incredible amount of talent that Jennings possesses. After a good summer of AAU basketball, and a solid performance on national tv earlier this year, Brandon Jennings struggled against Simeon on Thursday night. Jennings ranks 6th in the country among juniors, and rates as the top point guard in his class. Over the summer, he ran the point on the So Cal All-Stars, which also featured Kevin Love, Renardo Sidney, and Taylor King. As good as his Oak Hill team is this season, the team he ran over the summer in AAU was that much better. With this team, Jennings did an outstanding job creating for teammates both in the half court and full court. Thursday night Jennings struggled for much of the game, and didnt look nearly as polished as he did over the summer. He did make a few flashy passes early in the game, including a cross court no-look pass in transition. Jennings couldnt find his shot, however, and airballed a three early in the game. In the half court, he struggled to create many plays for his teammates, and spent a lot of the time sitting back and watching Alex Legion create. His play improved a little bit in the fourth quarter, but he took a number of bad three point shots off the dribble trying to get his team back into the game. At the end of the game Jennings sat on the bench crying on the sideline, but this game isnt much a reflection on the talent that he possesses. At this point in time, Brandon Jennings main strength is the ability he has to create shots for his teammates. He displayed flashes of this against Simeon, but he can usually do this throughout the game, and much more effectively in the half court. Jennings gets to the basket as well, and can finish pretty well, though he is improving in this area. As a shooter, he has a lot of room for improvement, but can make some long range shots from time to time. He will have to make some improvements to his ability to hit shots off the dribble, but this should develop more as he becomes more experienced. Another main weakness for Jennings is the fact that he always goes for the flashy play, and this leads to unnecessary turnovers. Jennings is a player whos not use to failing on the basketball court. The loss was the first of the season for Oak Hill, and he usually had comparable success in the AAU circuit with the So Cal All-Stars. He will have plenty of chances for redemption in the future, and one bad game shouldnt effect the perception on Brandon Jennings as a player. Jennings is a very talented point guard, who has been impressive throughout the tournament. He is very athletic, as he displayed on a fast break dunk where he exploded off the ground to catch an alley-oop pass. He is very quick with the ball, and has an explosive first step which allows great dribble penetration. He possesses a very good handle on the ball, but he is very left handed, and needs to go right more often in order to mix things up. Jennings has very good court vision, as he proved many times both in transition, and half court sets. He also showed some shooting ability, and even made a fall-away jumper from 17 feet. His shooting stroke is inconsistent at this point, but he does have good mechanics. Jennings is a good scorer inside, and uses his athleticism near the hoop, but he doesnt always convert on his drives. Jennings biggest weakness at this point is his tendency to try and be too flashy. He turns the ball over too much for a point guard with great court vision, and that is a direct result of him trying to be too fancy with his passes. On one occasion Jennings created dribble penatration and had an open teammate inside, but rather than throw a simple pass to his teammates hand, he tried a no-look pass which went right into the hands of the defender. Jennings also tends to be a little wild while running a half court offense, and needs to work on being more patient at times. Down the road he will need to work on developing a mid-range game. In his first game of the day, Jennings scored 8 points against the Michigan Hurricanes, while dishing out 8 assists and turning the ball over 4 times. Against the D1 Greyhounds, he scored 14 points, and handed out 8 assists with 3 turnovers. He has looked like a very promising point guard, and his combination of athleticism, court vision, and scoring. He will have to become more disciplined when running an offense, but he has a very bright future ahead of him.